Designed for the socio-economic development of people, mainly women from vulnerable and disaster hit communities. This program embodies the approach of eradicating poverty amongst the most neglected segment of society. A sustainable means of livelihood is developed by establishing Skills Development Centers (SDCs), Industrial Homes (IHs), and Institutes of Technical Education (ITEs). This is done so by providing employable skills, facilitating home-based income generating activities and developing market linkages. The vision of "One Home One Skill" is to sustain the livelihood of every household. To impart training in employable skills focusing on "One Home One Skill"
Handicrafts developed in these Skill Development Centers are shipped to HHRD Shop N’ Help stores located in Chicago and California and are also put on display by HHRD representatives in Arizona and Texas. This allows sustainable revenue for the beneficiary as well as an opportunity for our donors to connect with these artisans. Helping Hand is working towards converting all SDCs into Industrial Homes forming groups of women artisans in each to promote the concept of "one village one product". After the completion of skill development training at SDCs, many women join an Industrial Home to reap the benefits of their newly acquired skill. Building and essential equipment such as sewing and embroidery machines along with accessories and the running expenses are being provided by HHRD donations. One successful production of these homes is making school bags for children. Helping Hand has initiated the ITE program in Kashmir Pakistan, not only to provide better work opportunities but also technical education for men and women. Currently, 22 different courses in computers, heavy machinery operation, automobile, cooking, tailoring, construction, agriculture, and courses in education are being provided here. 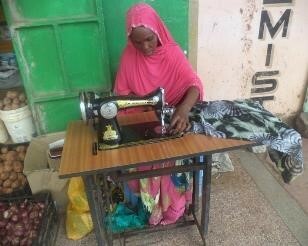 Meet Zeynab Sheikh Abdi whose training at HHRD Skills Development Centers has enabled her to start her own sewing business. Zeynab was forced to relocate to Somalia’s Banadir region due to constant conflict and the debilitating drought that affected her town. When she arrived to Mogadishu, her entire herd of 20 sheep and 9 goats had been wiped out by the drought. She sought refuge at a nearby Internal Displaced People (IDP) camp. 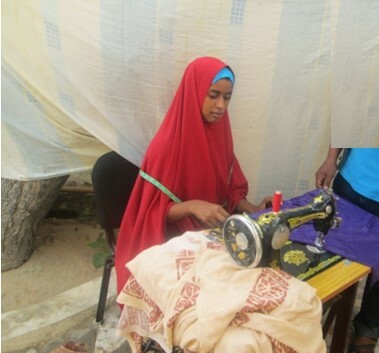 She joined HHRD Skills Development center where she was taught how to operate a sewing machine, knitting and making patterns, fabric selection, layout, cutting, marking and Somali dressmaking techniques. More importantly, trainees were taught about basic business management skills. After graduating Zeynab started her business that is growing leaps and bounds ever since. Issa Abdul Mansa, 21 years old from Madogo, Kenya, comes from a very poor family. 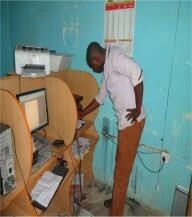 He was brought to our Skills Development Center where he enrolled as a computer student. 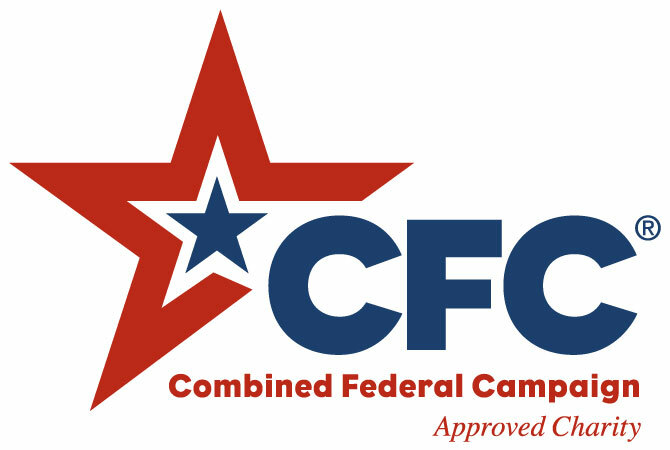 Upon completing the course, he received a certificate and was hired at a local cyber shop where he earns enough to supporting himself and his family. He says he will remember HHRD his entire life for offering him the skills that made him successful. 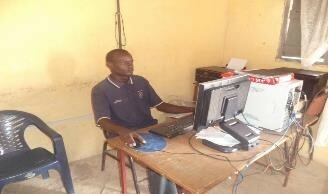 Mohamed Guyo, a former student at our Skills Development Center in Madogo, successfully completed our computer course and obtained hi certificate. Unable to pursue a degree at college due to monetary issues he found a job with the skills he learned and earns enough to save up and pursue a career in ICT. He is grateful to HHRD for these acquired skills. Orphaned at a young age Mumina Hassan was raised by a poor neighbor who was unable to pay for her secondary education. Shortly after getting married she became a widow with five children and burdened with the task of being the sole provider for the family. She eventually came to find out about our Skills Development Center and acquired sewing skills. Now she is able to support her family and send all five of her children to school. Her acquired skills has allowed her to work in Isiolo, Kenya as a seamstress. All funds raised for 'Skills Development Centers' will exclusively be designated towards the Skills Development Centers projects; after fundraising and administrative expenses.